Lightweight, comfortable, convenient and Silky and extremely stylish body. 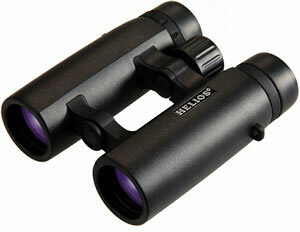 Ideal for nature observation and general outdoor viewing. High quality black rubber armouring for strong grip. 8x image magnification power with 32mm objective lens. Modern open-bridge roof prism design. Twist-up eyecups for spectacle wearers with eye relief of 14mm. Nitrogen filled and O-ring sealed for waterproof and fog proof protection. Silky and extremely stylish, finished in high quality black rubber armouring. MBK-7 borosilicate glass and all major optical components are fully multi-coated optics for more brighter, clear and detailed images.